KLORANE BLOND HIGHLIGHTS shampoo with Chamomile 200ml, a brightening shampoo for blonde colour hair enriched with Egyptian Camomile. With an ultra-gentle emulsifying base the Camomile shampoo gradually brightens and intensifies blonde and golden highlights. Hair is left supple and smooth with enhanced shine and radiance. Whether your hair is naturally blonde, colour-treated or highlighted, all blonde hair is made beautiful with the KLORANE BLOND HIGHLIGHTS shampoo. Active Ingredients: Camomile Flower Extract, Citric Acid. Hair Type: All Hair Types, Blonde Colour Hair or Highlights. KLORANE BLOND HIGHLIGHTS shampoo with Chamomile 200ml was found on 3 websites and was price compared using EAN: 3282779007481. 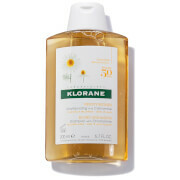 The cheapest KLORANE BLOND HIGHLIGHTS shampoo with Chamomile 200ml is shown as the main item, prices range from £5.33 to £8.00, excluding delivery. Price comparison based on price and delivery charges, with any valid discount codes being applied, is shown in the table above. Prices and information correct at the time of publication.